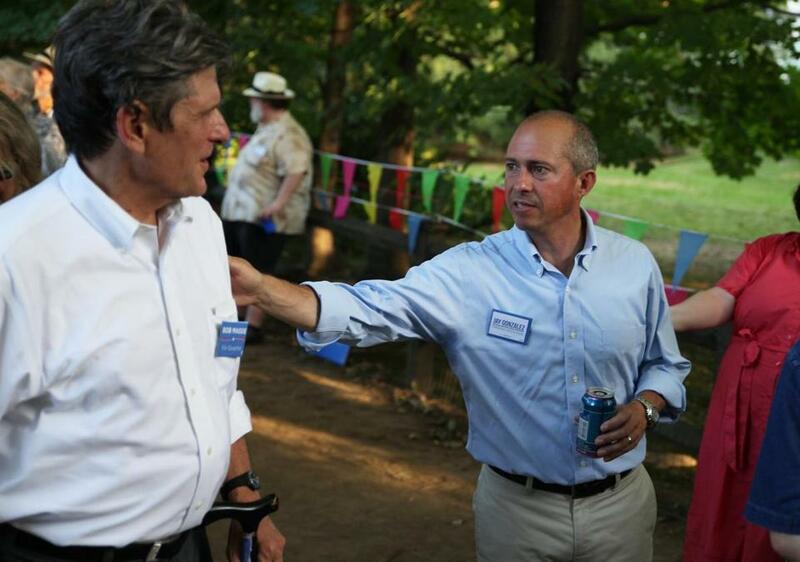 Democratic candidates for governor Bob Massie (left) and Jay Gonzalez campaigned in Newton on Labor Day. Jay Gonzalez, a former bond lawyer, state budget chief, and health insurance executive, won the Democratic gubernatorial primary Tuesday and will now attempt to unseat Republican Governor Charlie Baker, considered one of the country’s most popular politicians, in November. Gonzalez bested environmentalist and entrepreneur Bob Massie in the party contest by a wide margin. Massie conceded after 10 p.m.
Baker — who has emphasized tackling the scourge of opioid overdoses, increasing government efficiency, and connecting more people to the state’s booming economy — easily dispatched a longshot GOP primary bid by antigay pastor Scott Lively of Springfield. Gonzalez, who argues the state can and should aim higher when it comes to transportation and education, begins the nine-week sprint toward Election Day at a time when grass-roots Democrats are seen as more fired up about stopping President Trump than seizing the corner office on Beacon Hill from a moderate. But aides say Gonzalez will try to funnel anti-Trump sentiment into the governor’s race by arguing that Massachusetts needs a leader who will more vociferously challenge the administration. Gonzalez, who was leading Massie 65 percent to 35 percent with 83 percent of precincts reporting, faces several obstacles in his general election challenge. Polls have found he is little known among the broader electorate, and he confronts a monumental fund-raising disadvantage. The most recent state campaign finance data, which does not include heavy spending in late August, showed Baker with $6.6 million in the bank and Gonzalez with $367,000. And while national Republicans are pouring millions of dollars into Massachusetts TV advertising to boost Baker, national Democrats have indicated they have no appetite to spend money on what they perceive to be a quixotic fight. Baker, for his part, trumpets his record, pointing to more people working in Massachusetts than ever before, the lowest high school dropout rate in decades, and a billion-dollar state budget surplus. And Baker, who was leading Lively 64 percent to 36 percent, crows about his bipartisan achievements with the Democratic-controlled Legislature. But Gonzalez dings Baker as bereft of big vision and mired in a middling status quo that leaves too many behind. A top budget official in the administration of Governor Deval Patrick and later chief executive at CeltiCare Health Plan of Massachusetts, Gonzalez wants to raise taxes and plow the new dollars into fixing the state’s troubled public transit systems and expanding early childhood education. He also supports quickly moving the state to a single-payer health care system and ramping up Massachusetts’ efforts on climate change. The son of an American woman and Spanish man, Gonzalez grew up in Ohio, went to Dartmouth College, and, after stints as a private sector bond lawyer, joined state government. Gonzalez, 47, and Baker, 61, share several resume bullets: Both went to Ivy League schools, both served as health insurance CEOs, and both held the most powerful unelected executive branch position — overseeing the state budget bureaucracy. Both are also wonky by temperament and generally measured in their public remarks. Baker will run on a ticket with Lieutenant Governor Karyn Polito, who was unopposed in her GOP primary. Quentin Palfrey, a lawyer who worked in the Obama administration, won the Democratic primary for lieutenant governor, besting comedian Jimmy Tingle.